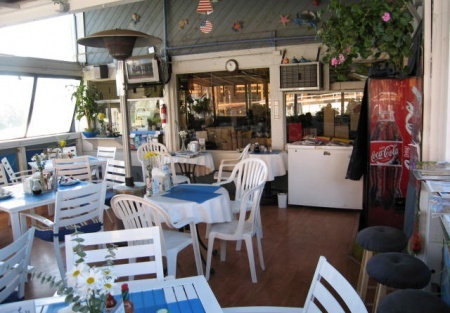 A gorgeous view of the harbor has been greeting customers in this Oxnard space since 1974. Currently it�s a casual sandwich shop serving breakfast and lunch daily with 1 full-time employee and 2 part-timers offering counter service to 26 seats inside (400 square feet) and 18 seats plus 4 barstools outside (400 square feet). The type 41 liquor license allows beer and wine sales. The owner, who wants to retire, has courted the locals. Although sales soar in July and August from extra tourist traffic, he has steady business all year round since the restaurant is right across the street from a large townhouse development. The asking price of $123K is moderate compared to his profit which should increase further once the under-construction shopping center next to his restaurant is completed (around late November). He has 2 years and 4 months remaining on his lease with one 5-year option. Lease expires February of 2010. The rent of $1285/mo. or 4% of gross sales includes CAM and gas. The chef is willing to stay with the new owner. There is plenty of parking in the harbor and no fast food or quick serve chains nearby at all. Many of the boaters order boxed lunches for their outings. A little charm would go a long way in this well-positioned caf�. Financials will be available to serious buyers. Submit the online confidentiality agreement in order to receive this restaurant's name and address. Completing the confidentiality form also entitles you to view additional photos and receive advance notice of new listings in your area so you can digest all the hottest bites first.